Kids ‘R’ Kids Learning Academy is fully accredited North Carolina 5 Star facility and offers the ultimate foundation for your child. We are very proud to provide the most effective educational programs and innovative facilities for children 6 weeks through 12 years of age. 1/8: Our Kids Cafe serves healthy hot meals! 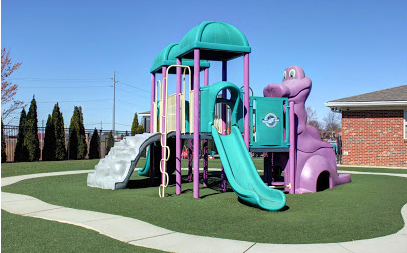 2/8: Our playgrounds are age appropriate, colorful and fun! 3/8: We love our outdoor spaces! 4/8: School buses with seat belts provide transportation to and from local elementary schools as well as to planned field trips. 6/8: Our cheerful secure lobby is the heart of our school! 7/8: Stop by for a tour anytime! 8/8: Our School Age Program provides an engaging and collaborative environment.